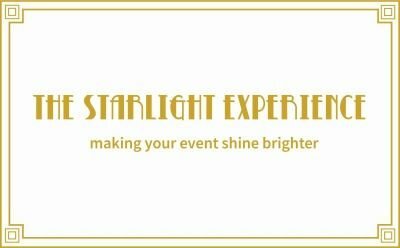 The Starlight Girls have not sat down these last few weeks, it’s been lots of fun, scary at times and a tad emotional – even the Wedding Cake has been in tiers (I’m sorry, yes that joke was truly called for!). Where do I start? I’d say that the theme of these last few weeks has been friendship building and oh have we made some lovely chums. Like Winnie The Pooh said “A day without a friend is like a pot without a single drop of honey left inside”. It's also very fitting as it's "World Kindness Week" and some of our new found friends have certainly shown true acts of kindness and really looked out for us. From being presented with a gorgeous bunch of flowers from Helen at City Brides, award winning hair and makeup artists complete with a glowing 5 star review for our Magic Mirror services at the stunning and prestigious Prestonfield House (thank you Helen) to an invite to appear at the majestic Barony Castle at their Wedding Fair and being crowned their newest "preferred supplier" on their exclusive list . There have been so many great highlights recently, too many to list but we thank each and every one of you - happiness is making unexpected friends. 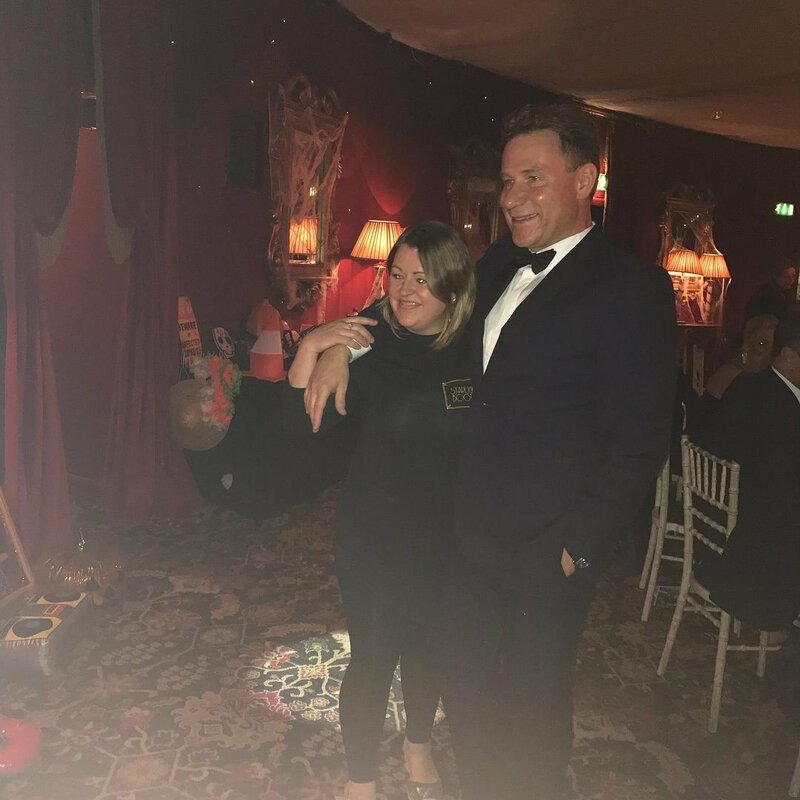 Anyway, enough of the Oscar winning speech, keeping on the celebrity theme - you'll never guess who could not resist the Magic Mirror's charms - Richard Arnold no less! The Good Morning Britain star was full of fun and humour as he was drawn to the bright lights and the cool animation and posed like the pro he is with Kirsty from Starlight Booths. Prestonfield House was starting to feel like home (if only it was) as our beautiful vintage mirror captured all the fun, two weekends in a row. The Scream Ball was truly frightening. People went to town with their awesome scary costumes, so much so our props have never had such a holiday as there was little need for them. Richard Arnold was a fantastic host and compere for the evening encouraging people to dig deep to raise funds for twp important causes, Royal Blind and The Sportsman's Charity. 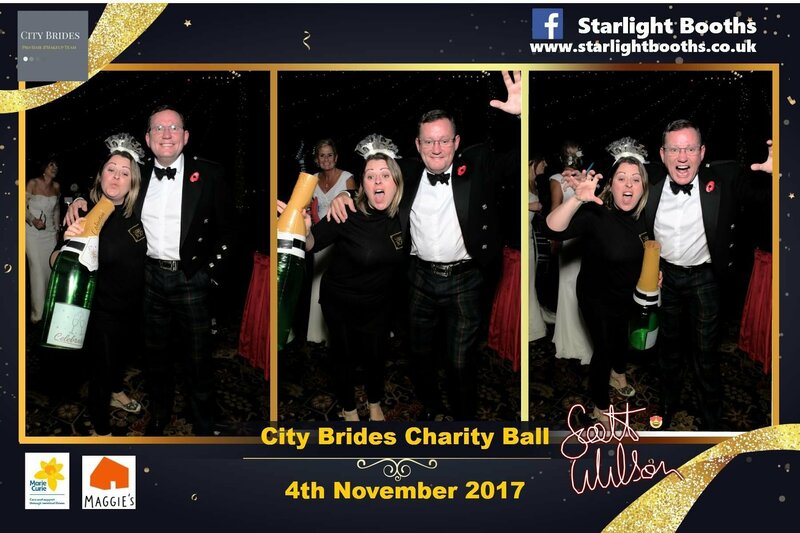 Much as we would have liked to, we couldn't hang out with our new celebrity chum forever, so we moved on swiftly (that's showbiz) and the following week hooked up with much loved former Forth FM DJ and respected broadcaster Scott Wilson who raised lots of money and many smiles at the City Brides Charity Ball at Prestonfield House with funds going to two fantastic and worthy charities Maggie's and Marie Curie. Some of the stories from people facing life-limiting challenges were very emotional but truly inspiring and it was utterly uplifting to see everyone at the Ball coming together to raise well needed funds. So we decided that we needed to spread the Magic Mirror love even further and attended the Corn Exchange Wedding Fair Edinburgh. A successful 2 days showing off the Magic Mirror's awesome features and the brand new animation that comes with the impressive V6 software. Thank you to everyone that stopped by to strut their stuff and struck a pose and to all the lovely Brides and Grooms who have booked us for their up and coming weddings, we cannot wait to be part of your beautiful and special day. It was nice to meet Kayleigh and Jeanette from Barony Castle (who were our friendly "show stand neighbours") which is a most stunning venue. 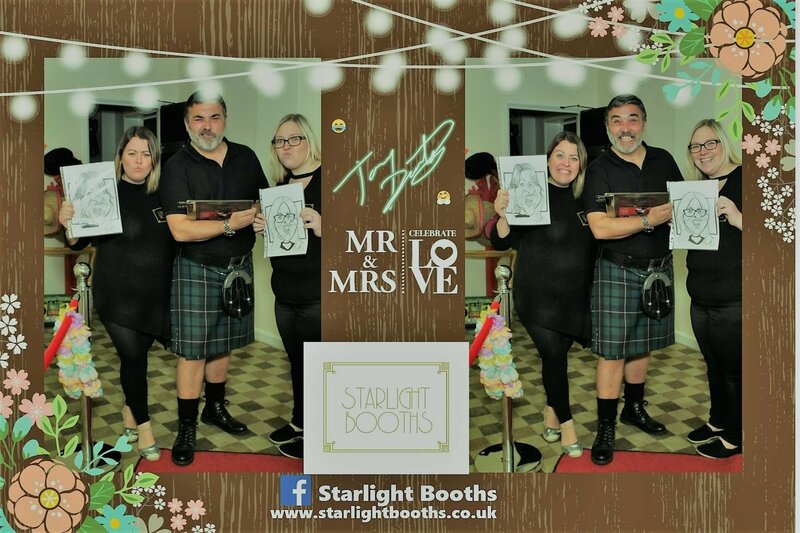 We were honoured to be asked to attend their Wedding Fair the following weekend where we met the charming Tony, aka the Kilted Caricaturist. Tony is so talented both as an artist and in the "Glasgow bants" who had me rolling down the isle - figuratively speaking not literally. I think Tony did a great job of capturing Louise's better side - what do you think? All in all, a busy few weeks on tour with our very clever, highly entertaining and gorgeous vintage magic mirror - we've had more stops than an X-Factor Tour Bus which have included Melville Castle, Waldorf Astoria The Caledonia, Prestonfield House, Barony Castle, Double Tree by Hilton Queensferry, Edinburgh Capital Hotel and Corn Exchange. All these venues are gorgeous but more importantly run by truly exceptional event organisers who also happen to be extremely friendly and caring too. You can't blame us for the lack of chat as we've been more jammed packed full of action than an Arnie Schwarzenegger film - Louise and I can relate to his muscles, ours are tuning up nicely, transporting the Magic Mirror to all these beautiful venues is better exercise than a 24 hour gym session. We are super excited looking forward to the next few weeks, we are literally booked out for the rest of the year with an adoption party, a 50th Birthday Party and we are very proud to be part of Dynamic Earth's Christmas Party Nights throughout December. As night falls, Dynamic Earth is transformed into a glamorous and visually stunning party venue. "Light Up your World this Christmas" at Dynamic Earth must not be missed. So, catch us at a venue near you, we'll be flexing our new found biceps this Christmas!!! 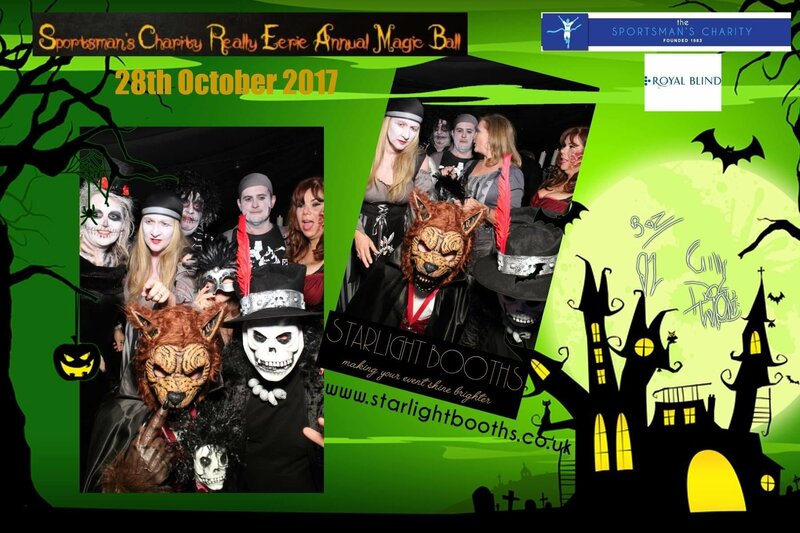 Starlight Booth girls - making your events shine brighter.